We recorded it last night and you can listen to it now: Six Kotaku editors! Locked in one location for an hour discussing E3! Not much sleep. Plenty of game talk. Plus: What Is the Most Dangerous Tech At E3? We might as well call this a Very Unusual Episode of our weekly Kotaku Talk Radio podcast, because, for once, we are not live, have no special guest and aren't taking your calls. 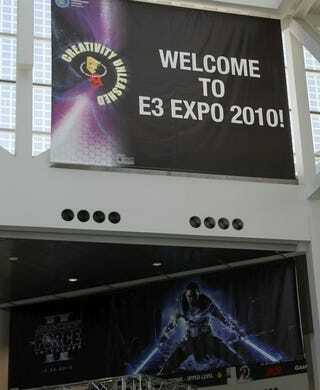 Hey, it's E3! We had to do something different. If you can't listen live, this episode will be available for download later today.